Answer : Profit of Rs 700. Answer : 100 m below sea level. Q2. Represent the following numbers as integers with appropriate signs. (b) A submarine is moving at a depth, eight hundred metre below the sea level. (c) A deposit of rupees two hundred. (d) Withdrawal of rupees seven hundred. (a) If point D is + 8, then which point is – 8? (b) Is point G a negative integer or a positive integer? Answer : Point E has least value. Q5. Following is the list of temperatures of five places in India on a particular day of the year. 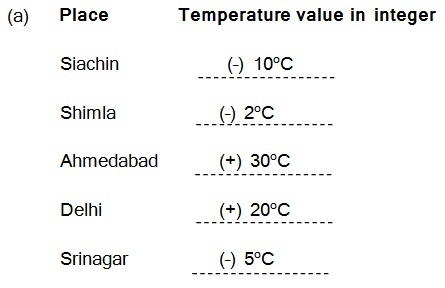 (a) Write the temperatures of these places in the form of integers in the blank column. (b) Following is the number line representing the temperature in degree Celsius. Plot the name of the city against its temperature. Answer : Delhi and Ahmedabad. Q6. In each of the following pairs, which number is to the right of the other on the number line? Q8. (a) Write four negative integers greater than – 20. Q9. For the following statements, write True (T) or False (F). If the statement is false, correct the statement. Solution: We should move to left side. Solution: We should move to right side.